The Pentagon next month is set to award a single company an estimated $10 billion contract for cloud infrastructure and platform services — the largest information technology procurement in U.S. government history. The single cloud would cover multiple security levels across different departments at the Pentagon, with the aim of reducing management and administrative burdens, for as many as ten years. 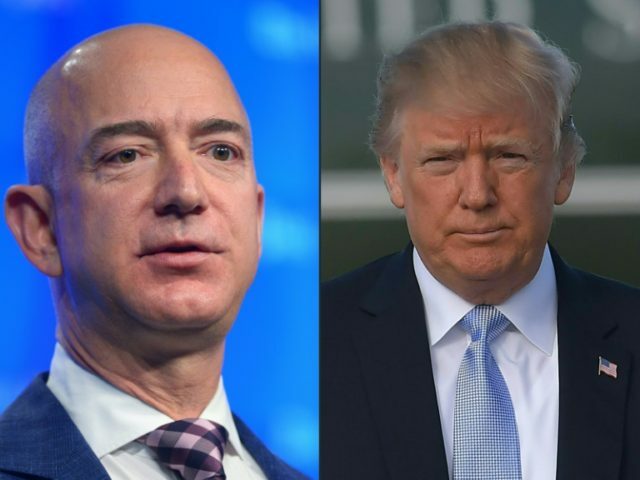 Competitors, and even some partners of the online retail giant, are crying foul — arguing that the contract is being unfairly tailored for Amazon and will ultimately waste taxpayer money and potentially harm national security. “This is not a small potatoes thing. This is billions and billions of dollars,” said one industry source. Industry officials — both competitors and partners with Amazon — argue that having one cloud computing service provider to fulfill this role makes no sense, and they say that a multi-cloud system would work better. The Pentagon has strongly denied that any company is predetermined to be awarded the contract. “This is a full and open competition. We want people to be as creative as possible. This is important. This is not business as usual. The secretary’s been very clear that we need to be good stewards of the American people’s money. So nothing is taken for granted. Nothing is presumed. And we will get a full, open and transparent competition. And this is the first of many competitions with respect to the cloud,” Pentagon chief spokesperson Dana White said Thursday. But industry officials — who are under a DOD gag order — point to signs they say indicate that Amazon will win the contract. About a month ago, the Pentagon made a sole-source award of $950 million to REAN Cloud to migrate Pentagon programs and software to a cloud. In the company’s press release announcing the award, it boasted in its first sentence of being an Amazon Web Services partner. “What the Pentagon did was tip its hand. It said, ‘We’re choosing our migration partner, which is an Amazon partner, before we’ve even chosen our cloud partner,’” said a third industry source. Another sign was that in the Pentagon’s request for information (RFI) that was sent out to the industry in November, it asked prospective cloud service providers to respond with their experience working in secret and top secret clouds. Some industry competitors suspect personal politics are at play. “When you look at the people who are at the center of making these decisions at the Pentagon, these are all Obama administration, [former Defense Secretary] Ash Carter holdovers,” said the third industry source. The source pointed to Raj Shah, who just recently stepped down as the head of the Pentagon’s Defense Innovation Unit Experimental (DIUx) office in Silicon Valley. Shah was appointed as head of the office by Carter and served until February. They “routinely” funded Amazon partners — including REAN Cloud, the source said. Chris Lynch at the Pentagon’s Defense Digital Service (DDS) is “heavily wired into the AWS community,” the source added. The chairman of the Pentagon’s Defense Innovation Board, Eric Schmidt, chairman emeritus of Google, recruited Jeff Bezos to the board, though he is not listed as a member of the board on the Pentagon’s website. And even Defense Secretary Jim Mattis’s former senior adviser, Sally Donnelly, had links to Amazon, according to the source; her consulting firm had AWS as a client. The Pentagon told Defense News that Shah would remain attached to DIUx in “some capacity” through his service in the Air National Guard. Industry sources say if Amazon wins the contract, it will have huge repercussions on national security, price, and innovation. They argue that using one cloud service provider could make the Pentagon vulnerable to interruptions. The industry sources argue that every cloud service provider, even the major ones, have gone down at one point. According to a 2016 Microsoft study, nearly 80 percent of companies use more than one cloud. For example, Apple uses multiple cloud services for iCloud: Amazon, Microsoft, and Google. The study also argues that a single award contract would reduce competition, which would lead to higher prices and less innovation. “If you went to a single cloud provider for ten years, you basically say, ‘I’m not interested in what Google or Microsoft or Amazon or whoever wasn’t selected, and what they’re doing. I’m just going to put all my eggs in this one basket and hope for the best,’” said the second industry source. Choosing one company to perform the contract would effectively lock the Pentagon into that company’s innovation and pricing pipeline, sources argued. “Competition makes us all better athletes. We don’t know today what cloud will look like tomorrow. And locking yourself into the innovation pipeline of one company, and then also the pricing pipeline of one company, takes out their incentive to continue to be better and do better,” said the fourth industry source. Already, the CIA has had some performance issues with Amazon, which won the award to build C2S, the CIA’s cloud for secret and top secret data. The contract also gave Amazon sole accreditation for handling secret and top secret data, insulating it from competition. While DOD agencies will not be banned from awarding smaller defense contracts to other cloud service providers, there would be pressure to use Amazon, sources argued. The reason is that many Pentagon applications that will be migrated to the cloud will need to be rewritten to be compatible with the cloud, and once that happens, the incentive will be to continue using that cloud. “What you don’t want to do is to lock in a single cloud provider, in kind of a one-size-fits-all approach for this really wildly diverse set of applications that could reside in it,” the second industry source stated. Industry sources believe that Defense Secretary Jim Mattis has delegated responsibility on the cloud contract to technology experts on his staff. Asked about the contract last month during an off-camera gaggle, he told reporters he did not want to discuss the contract because he did not want to interfere in the process. “I don’t want to go into that contracting bit because, very quickly, I can’t get into jury-rigging a system that’s designed not to be jury-rigged,” he said on March 27. He also denied that the Pentagon has not been transparent with Congress on the contract. Congress has expressed concern about the contract and inserted language in the omnibus spending bill to exert oversight over the contract. “There are concerns about the proposed duration of a single contract, questions about the best value for the taxpayer, and how to ensure the highest security is maintained,” the language said. The bill requires Mattis to provide a report to Congress that includes “justification” and “cost considerations” for awarding a single award contract, instead of using a hybrid-cloud system with multiple cloud computing service providers, by the end of May — about the same time the contract will be awarded. The bill also requires Deputy Secretary of Defense Pat Shanahan to provide a report on the contract request for proposals 45 days after the bill’s enactment, by mid-May. The timelines have concerned industry groups, who argue the Pentagon will not have time to reconsider the contract if necessary. So far, Trump has not weighed in on the Pentagon contract, but he has stepped up attacks on Amazon in recent days. Last week, Oracle Corp. Chief Executive Safra Catz raised the issue with Trump during a private dinner at the White House, according to Bloomberg. Trump reportedly told Catz he wanted the contract competition to be fair but did not indicate whether he would take any actions.